Ballack and Ozil: Will recent fortunes be reversed? 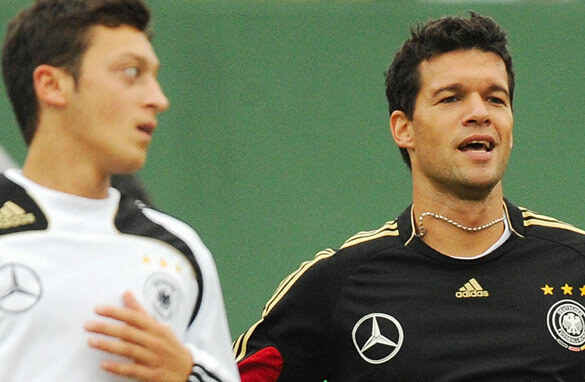 Mesut Ozil (left) and Michael Ballack (right) have interesting seasons ahead of them. On the eve of the new Bundesliga campaign, there are two players who in many ways symbolize the changing of the guard in terms of the leading talent that will now drive the German national game. The World Cup often proves definitive in the careers of footballers, and considering the pedigree of German participation at the most prestigious tournament in global soccer, any progress is invariably watched by fans across the planet. The experience of Michael Ballack and Mesut Ozil over the showcase in South Africa, however, could barely be more contrasting. Ballack, prior to June, looked set for an awesome finals. The free-scoring captain of the side, coming up for his hundredth cap, was aiming to better his second and third finishes at previous World Cups by lifting the trophy in Soccer City. Sadly, injury ended any such ambition. He missed the competition, lost his captaincy, and then was let go from newly crowned English Premier League champions Chelsea on a free transfer. In the same short period, the fickleness of fate saw Mesut Ozil rise to international prominence with meteoric speed. Having been part of the youth side that claimed the Under 21 European Cup in 2009, he stepped up to the senior side and helped take Joachim Low's outfit to the semifinals, with a number of scintillating performances. Such exposure saw the attacking midfielder pursued by the biggest clubs the game. But whose boots would you rather be in? I’m not sure the answer’s as clear cut as you’d think. OK, Michael Ballack’s absence didn’t seem to pose Germany many problems at the World Cup. And not missed by his national side, he wasn't wanted by Chelsea either. Consequently, Ballack has returned to the Bundesliga, where he made his name with Leverkusen. He knows the club, and he knows the league. At Chelsea , he became excess to requirements. At Leverkusen, the game will be built around him. Ballack will lead from the front. And he'll get all the pitch time his ageing legs allow. This could be his best chance to regain the captaincy he lost at the World Cup. It's a final chance to shine for a dimming star. Ozil’s performances in South Africa led to interest from Manchester United, Barcelona and Real Madrid. The will-he won’t-he dragged on for weeks after which he finally chose to sign for Jose Mourinho's Madrid. In my opinion – a season too soon. Ozil is still young – both on the pitch and off it. Yes he was outstanding in South Africa , but he was up and down for Bremen. Now he’s waved goodbye to the peace, quiet and relative anonymity of the northern German club … to head to the European colossus that is Real. And the competition, expectations and stardom could well swallow him up. An extra year at Werder, in a key role for the club, and he’d have been ripe for the picking. Harvested too soon, his crop of skills could go to waste. No question about it, Ozil’s talent is a blessing. His rise to stardom though – in my opinion – was not. Ozil refused to sign a new contract and was always going to be sold by Bremen for fear of losing him for nothing. The World Cup merely increased his price. Seemingly very few players can resist the temptation of the big clubs. Metzelder was the last German to go to Real. He sat on the bench and was not nominated for the Nationalmannschaft in 2010, despite having been a steady figure for the team in the past. Özil and Khedira may suffer the same fate. Germany has no stars, the star is the team. Both are great young talents, but if they are not ready for Real they put their spot in the national team on the line. If they don't play they are out. Bremen plays champions league, if I were Özil I would have waited at least 2 more years. Then again if he fails now he can still be ready for the world cup 2014 even if missing the euro. Agree, it's a season too soon, but on the other hand, as he said to the press: "The train "Real Madrid" passes by only once in a lifetime, and when the train stops to pick you up, you better get on it"
ozil will be a much more better player in real.It will depend on his hard work. Great player. I wonder how Mourinho will use him with so many midfielders, but I am sure he will be a great addition to the Merengues! Yes, Ozil could have done with an extra year of development at Bremen. But the reality is, after his World Cup performance, Ozil was never going to stay at Bremen beyond the conclusion of his contract next summer. Weder did what any club would do and cashed in on him while they still could. I hope he gets game time this season, but in a club like Real even a young star like Ozil is no certainty to be a regular in Mourinho's starting 11. Regardless of this, I think Low will always find a place for him in central midfield for Germany. Although, with Ballack back in the Bundesliga, Khedira's place in the national side may not be a surety. Excellent voice and exciting delivery on CNN. You are already a superstar. Do you also do live commentary of games on the radio? You should. A team, no matter how successful, wouldn't want to leave someone like Ozil on the bench. He is a joy to watch play. Very creative he is. I don't think he will have any problems proving himself up for the job. I thought his price was too low though. As for Ballack, it seems odd that a man who held up the English championship trophy would be fired the following season. Though I imagine it fairly difficult to shine beside the likes of Drogba. Sad not to have seen an interview with Drogba on CNN after he shot the most goals in all of Europe last season. Maybe you might give us the chance. He deserves it. Keep up the good work. I enjoy watching your show. Hi,i must say i love ur work on CNN sport but anyway Michael ballack wil have a far better season than Oezil.I think ts bcoz of his great depth knowledge of the german game,he has proved his worth in the past wen he was at munich but for Oezil he might have 2b contempt with the no. of holdin midfielders at Real.With the likes of alonso,granero,diarra,kaka n new signings canales n khedira it will be a very tough one for him.Keep up the good work Giles! Ballack is such a nice, lovable guy who took all the personal disappointment in stride. I recall after the friendly against South Africa, Ballack said of Ozil – "Germany had finally found a number 10". I believe Chelsea stand to lose after the release of Ballack. In that they lost their most intelligent player, the only player in the Bundesliga that could match Fabregas for the killer pass. Mickel and Essien are not that intelligent. As for Ballack, going back to Leverkusen was a wise decision, because he is bound to partner another great star, Simon Rolfes, in potentially the Bundesliga's best midfield partnership, which was supposed to be Germany's preferred pairing at the world cup had it not been for injury. I think Ozil is one of the youngest midfielders at the moment but the choice of madrid is not the best. Ozil should be give time to learn the arts of football with clubs like Barcelona. This could have prepared him to take the centre stage as the best footballer on planet later. Anyway, I wish him success in Santiago. I think it was to early for Ozil to move on, he was suppose to mature at Werder before moving on. Real Madrid wants players who are already up to the task no room for errors, their philosophy is to win and win only..
Definately wrong choice for Ozil, he wd have joined Man united like Ronald did then join Madrid when he is 26 or so. Madrid is not a good club for young stars lke him. Look at Benzma another wasted talent coz he choose poorly,Robben, Vander vart, among other didnt make it at Madrid. Let me wish him all the best & watch hw he rubs off my critics. Go Mourinho go Madrid go Ozil. Tough season ahead. wrong choice for Özil. Too soon. Should have waited another year, but the offer was probably too tempting. We have seen many players go to Real Madrid, warm the bench for 2 seasons and leave again with a damaged reputation and self confidence in shambles. The air is very thin there and the environment quite hostile. Özil signed with RM too soon. Should have stayed for Bremen, not only to get to play as a starter at every game but also to gain experience. I am not a fan of Madrid since they always sign everyone and have tons of players sitting on the bench who would fell in love with the idea of playing for RM but ended up just being a bench warmer even though they are amazing players and could achieve outstanding things with other clubs. But overall it's Özil's choice and I hope he gets to play there and become an even better player than he already is. Ballak remains a great player with a great attitude.His just been having it rough with injuries,and he's not getting any younger. Ozil,an exceptional lad,with great footballing attributes.He is younger and has a great future ahead of him.Did he move to Madrid too early and soon? I don't think so.He just have to stay discipline and positive. Kate,I think Thomas MUller will sure turn out the star of his generation. I agree with Kate that Ozil could've made a hasty decision to join Real Madrid! But on the other hand, he was given an opportunity which only comes once & he decided to grab it! as for Ballak he took the right decision to join a club that could utilize his experience albeit at a reasonable pace! haha, looks like this article needs to have a serious follow-up! and serious research! seriously! Özil has fit in very, very fantastically smashingly well in Madrid. and Khedira, too. RM Pres. Florentino Perez is not stupid enough to repeat the same mistake as he did in 2003 in "letting go" Vicente Del Bosque. And remember, Perez hired Jose Mourinho FOR A REASON! To win titles, not dilly-dally and get knocked out after the first few rounds. The past decade has been a joke, and no wonder Barca kept winning. (of course, not counting that iffy El classico last November, Mou's RM is an early project, and there's something happening behind the scenes, what with Sergio Ramos shoving Puyol and Xavi, et.al in the end) This is Real Madrid we're talking about, they have to keep up with their reputation.. in terms of History... they've had enough of being mocked at as a "walking bank account" and "benching players". Can you blame them for taking a different route now? It's about time, really.